Due to some technical issues, I took down my regular author website, and have redirected to my earlier blog until they are resolved. But since that might leave you disappointed, I'll post a status update here as well as a poem and a short story. Because poems and stories make everything better, even technical difficulties. 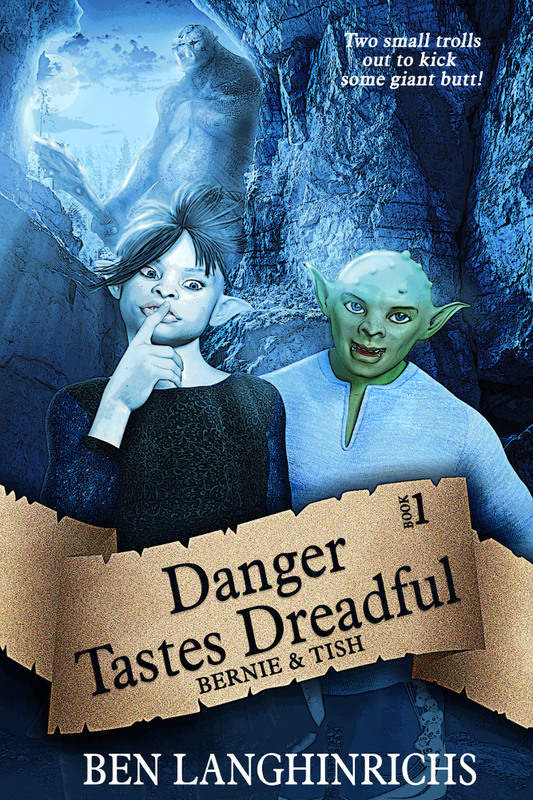 My latest novel is another middle grade fantasy, but very different than Danger Tastes Dreadful. While that is more straightforward and usually termed "lower middle grade", this novel is longer, more sophisticated, and uses an unusual narrative structure. With seven embedded original fairy tales (one is a classic fairy tale retold from the villain's POV), a three part structure that echoes how classic fairy tales unfold, and a slew of literary and pop culture fairy tale references, this novel is funny, sweet, and ardently pro-consent. Told in first person present from the point of view of a quiet boy surrounded by strong girls and women, this turns many fairy tale tropes on their heads without ever sacrificing the compelling narrative that drives him forward. After feedback from critique partners and beta readers, this has been polished and strengthened to the point where I am ready to send it out to agents and see how it goes. Will I stop tweaking and rewriting? Probably not, especially as a couple of straggler beta readers may come up with new suggestions. But as self-critical as I can be, I am comfortable releasing my baby to the publishing world. It is always a leap of faith, but eventually you have to either leap or stay glued to the cliff. Because there are several important witches in this novel, I include here a witchy poem, this one published in Feathertale in 2010. Below that, I have included a riff on the classic Little Mermaid story which was published several years ago by Enchanted Conversation. Enjoy, and I hope next time you visit, my author website will be back again. Thanks for your patience. Nothing evil left to do or see. A shame a bath would spell catastrophe. Could a bit of water dangerous be? Dreaming of the soapy sloshing. Cloak and broomstick all that's left of me. Once upon a time, an evil witch lived in the depths of the ocean in a castle built of the spars and timbers from shipwrecks. She had one daughter, a lovely mermaid named Tempterra. Tempterra was lonely. No mermen dared approach the witch's castle, and Tempterra was not allowed to attend the royal balls and merriments of the Sea King. Her only companions were stingrays and sharks that waited upon her mother. One day, as Tempterra floated alongside a basking shark, she spied a regal ship. Curious, she watched it sail closer. At the prow stood a man so handsome, he took her breath away. Tempterra watched as he strode the decks, giving orders to the seamen in a voice that was firm but kind. Returning to the castle, Tempterra told the witch, "Mother, I have found the man I want to marry." "Where did you meet this merman?" asked the witch, eyes narrowing. "He is not a merman, but a human. I saw him on his ship," confessed Tempterra. "I must make him mine. Please, Mother, won't you help me?" The witch stormed and raged, but at last relented. "I will give you three chances to walk the land as a human. Each time, you may rise from the sea on human legs in the morning, but you must return to the sea before sunset, unless you have married your love." "And if I do, may I stay with him as a human?" asked Tempterra. The witch sighed, but said, "If you marry him and spend one whole night in his bed, you will remain human forever." "And if I do not wed the prince in three chances?" The witch smiled. "Then you will return, and never again venture to the surface." Tempterra didn't hesitate. "I will do it." The witch frowned, but gave Tempterra three pearls of translucent beauty. "Swallow one pearl each time you would walk the land. However, beware. As the sun sets, you will return to your natural state unless you have married." Tempterra kept the three pearls in a locket around her neck. Each day, she scanned the horizon and held the locket close. One beautiful morning, Tempterra saw the ship again. She followed as it sailed ashore, and saw the mysterious man on deck. A crewman called out, "Brace yourself for landing, Prince Henrik." A prince. Tempterra thought her mother would be pleased with such a catch. Then she frowned, as she realized how difficult it might be to meet the prince. When she looked up, the ship had docked. Tempterra swam quickly to the beach and pulled herself ashore. Gasping on the sand, she reached into her locket, took out the first pearl, and swallowed it. She felt a searing pain as her tail split into two legs. As the pain subsided, she raised her head. The prince had disembarked and was almost out of sight. Awkward on her new legs, Tempterra could not reach the prince before he entered the palace. The gates swung closed with Tempterra, dismayed. She hobbled to the gate and knocked. At first, nothing happened. Then a window opened, too small to see through. "Who goes there?" the guard asked. Thinking quickly, Tempterra said, "I am a poor maiden from a faraway land. I have an important message for His Highness Prince Henrik." The voice growled, "His Royal Highness does not take messages from commoners," and the window slammed shut. It would not open again, no matter how piteously Tempterra begged. The day passed, but Tempterra could find no way into the palace. As the sun sank, she trudged back to the beach and slipped into the waiting waves. She had wasted one pearl. For weeks, Tempterra watched to see the ship. Her heart grew heavy as she imagined a lifetime beneath the waves, alone. Then one day, Tempterra saw the ship leaving port. Determined, she swam close to the ship, risking discovery. The ship sailed further out, and Tempterra followed, fearful she would miss her chance to meet the Prince if the ship did not return to shore by nightfall. As dusk approached, Tempterra's heart grew dark as well. She thought she would never meet the prince, and might as well return to her mother. That gave her an idea. She raced back to the castle. "Mother, I need a mighty storm." The witch was surprised by this request. She liked nothing better than stirring up a tempest, but Tempterra was not usually interested. The witch closed her eyes and uttered dark incantations that roiled the water. However, when she looked to see if Tempterra was pleased, her daughter was gone. Streaking toward the ship, Tempterra planned her approach. After the storm capsized the ship, she would find the prince and help him to shore. In gratitude, he would be sure to marry her. Through the crashing waves, she saw the ship in mortal peril. She waited until the ship went down, and then swam into the wreckage. She encountered many struggling sailors, but not the prince. Desperately afraid that the prince had drowned, Tempterra dove again and again, but could not find him. Filled with remorse, Tempterra realized what she must do. She swam against the storm toward shore. She swore that when she arrived, she would swallow another pearl and go to the King and Queen to apologize for her reckless deed. Tempterra had no doubt of her fate after such a confession, but she saw no purpose in living without her prince. It was morning before she reached shore and swallowed the second pearl. As Tempterra stood on the beach, she saw a most amazing sight. Lying on the shore was her prince. Tempterra stood speechless, but realized her plan might still work. She ran to the prince and knelt beside him. As she touched his face, the prince's eyes opened. The prince looked up at Tempterra, and she could see the love grow in his deep blue eyes. She caressed his cheek, and he murmured, "Thank you! Thank you for saving my life," before fainting again. Tempterra found two men mending nets. They hurried to the beach and lifted the prince in their arms, while Tempterra followed. At the palace, the gates flew open when the men shouted their news. Tempterra tried to enter as well, but the guards prevented her. She pleaded, saying that it was she who rescued the prince, but they would not believe her. Desolate, Tempterra returned to the beach. Weeping where the prince had lain, she did not wait for night, but returned to her home under the sea. For weeks, she stayed in her room, crying and eating almost nothing. In time, the Sea King's youngest daughter, Sirenetta, came to the witch to plead for a chance to meet the man she had helped to shore. The witch knew he must be Prince Henrik. She saw a chance to hurt the Sea King, while proving to Tempterra that human men are fickle and unreliable. The witch granted Sirenetta's wish, and watched in her magic glass as the prince found the transformed maiden. She showed Tempterra images in her glass of the prince with Sirenetta, but Tempterra turned away, sobbing, and swam from the room. Weeks passed. The prince attended to Sirenetta, but seemed uninterested in marrying her. Tempterra kept to her room, crying herself to sleep. The witch grew angry. "Tempterra, no more of this tiresome weeping. Use your third pearl tomorrow, or lose the chance forever!" Tempterra was distraught. What chance had she to win the prince's heart? He spent his days with the lovely maiden, while Tempterra could not pass the gates. In the morning, Tempterra swam to shore, hoping for a miracle. As she swam, she saw a foreign ship sailing toward land. Conceiving a plan, Tempterra slipped up to the ship and found a stray rope. She swallowed her last pearl, climbed the rope and hid behind the large anchor. When the foreign ladies and gentlemen disembarked, the prince was in the royal greeting party. Tempterra's heart pounded as she slipped to the end of the procession. Would she be caught? How could she make the prince notice her? But when the prince caught sight of Tempterra, his eyes lit up instantly, and he rushed to her side. "You are the fair lady who rescued me. I have longed for your return." The prince asked Tempterra to marry him that very day, and she agreed. The wedding was held that afternoon onboard the prince’s new ship. After a glorious celebration, the prince escorted Tempterra to the royal cabin. In the middle of the night, a sound startled Tempterra awake. To her surprise, she saw the young maiden her mother had shown her, leaning over the prince as if in embrace. Before Tempterra could speak, the maiden stood, blew a kiss to the prince, and slipped out of the cabin. Tempterra's heart broke. Pride prevented her from demanding an explanation, but tears trickled down her cheeks as she gazed at the prince. At last, she crept from the cabin and dove into the chilly waters. As she grew back her tail, she vowed never to return to the surface. Back in the castle, the sea witch watched in her magic glass and cackled with glee. She knew she must hide the glass from Tempterra. It was only a matter of time before the prince found a new wife, and Tempterra didn't need to see how quickly the prince forgot her. As the sea witch swam toward the lowest reaches of the castle, she looked again at the glass and gasped. The prince stood on the railing of the ship, staring down at the churning water. As she watched, he dove off after Tempterra. The witch laughed, sure the prince would give up after a few minutes of futile searching, but he swam down with steady strokes. Even when he must have been fighting for breath, the prince continued his relentless quest. "Fool, what are you doing?" screeched the sea witch, but the prince swam deeper and deeper. The sea witch watched Tempterra swim away, unaware of the struggling prince following her. Before long, the prince slowed and stopped, unable to continue but unwilling to go back. The sea witch stared at the drowning prince, realizing at last the depth of the love between him and Tempterra. She knew Tempterra's transformation could no longer be undone, but thought she might save the prince if she moved quickly. She uttered a hasty incantation, and the vision in the glass whirled with clouds. When it cleared, the prince still floated silently, but his legs had combined to make a merman's tail. For a moment, the sea witch thought she had waited too long, but then the prince opened his eyes. Even with the shock of his transformation, he continued after Tempterra. The sea witch put down the glass and swam to reunite Tempterra with her husband. I've been working on a new Author webpage, and it will be up at this address shortly. In the meantime, thanks for stopping by and my apologies for the missing content. For those looking for my new book, it is out there and available. You can find it on Amazon US, Amazon UK, Amazon CA (or any other Amazon by searching for Danger Tastes Dreadful). You can find it online at Barnes & Noble. You can call or walk into almost any bookstore and ask them to order it for you. For local Shaker Heights people, you can find it at Mac's Backs on Coventry. Thank you, everybody, for all the support! On Nov. 8th, I got my "content edits" back from the editor for Danger Tastes Dreadful. I must admit, I was quite nervous, but I needn't have been. She made some very helpful suggestions, including a rewrite of one scene, but didn't think anything major needed changing. Thank goodness, as I am very busy at work. Of course, this does not mean I sat down and made all the necessary changes immediately. I went in and tweaked the small stuff she identfied, and then read all the comments and put it away. Every few days, I go back and work on it a bit, letting myself think through some of the deep topics such as "how can there be eels if they are so far from the ocean". A perfectly good question, and it happened to mean some changes in four different parts of the novel, including a couple new lines for a song they sing. I need to be done by December 1st, which should be no trouble at all. If there were more significant changes, we'd probably go back and forth a lot in December, but I would guess it will be fairly straightforward since the changes I've made will be so relatively minor. Then on to copy-edits! Also, they've told me that the book will be released in August. Not great for summertime middle grade reading, but perhaps well suited to homeschool reading curricula. A multi-book deal for unrelated books (as opposed to a series) means you have to satisfy the editor with subsequent books, which can be harder than it sounds. Agents are great, except when they're not. Not all publishers are transparent with their authors, not about the size of print runs, and not even about little things like when they schedule giveaways. Be prepared to be caught unawares. Writing a first book is hard, and may take years. Writing a subsequent book is often even harder, but faces short deadlines and high expectations. I heard back from my content editor (Yes! I have a content editor), and now have a rough timetable for Danger Tastes Dreadful. Without going into too many details, the plan is to have the developmental edits in a few weeks, revise/rinse/repeat, and have the novel ready by about May. So excited. There are more iterations than I expected, but I'm enthusiastic about this. As my debut novel, I want it as clean and polished as possible. I've been reading blogs and suggestions about how to handle the first round of edits, though I doubt anything will fully prepare me for it. Girding my loins and all. I've been accepted into Electric Eighteens, a group of authors with their YA/MG debut in 2018. It is fascinating for me, as there are authors with the Big 5 publishers along with a variety of small publishers. There is a lot of discussion about different steps and decisions, some of which I've never considered as part of the process (e.g., who will host your cover reveal, or will you handle it yourself). I am trying to learn everything I can from everybody, and trying not to feel inadequate because I don't have an agent, so I don't have that sort of advocate/buffer. Fortunately, the people at Clean Reads are great, so I also haven't need it much. Aside from waiting on the developmental edits, I am starting to think about the cover. I sent off my notes about themes and scenes and all, so now I wait to see what they'll make of it. I hope they find a way to represent the trolls that works well. I'm hoping to capture some of the process as I prepare Danger Tastes Dreadful for publication, for my own sake and for others as well. With this in mind, I plan to talk about each step of the editorial process. I got my New Author packet from Clean Reads. It had various forms to fill out including tax forms and forms regarding author information and cover art and so forth. It also had a document describing Pre-Edit guidelines. I'll admit, I am enough of a newbie at this that I hadn't expected a "pre-edits" phase, but as I went through the process, I grew more and more enamored of it. The reality is, after tweaking here and there over a long period of time, many typos had crept in. Also, a full read through by my wife, an excellent editor in her own right, made it clear that my characters had some inconsistencies, and that some themes were not carried through completely. That latter is because parts of the themes were added after the initial revision process, but were more focused on the beginning and end of the book. So, I put on my revision hat again, and cleaned up and polished and made things more consistent. There were modifications in almost every chapter. Now, the pre-edits version has gone off to the publisher, and I will wait many weeks for what I think will be the developmental edit. But I may have missed a step. In any case, so far I am very happy with the process, and am more confident that my novel will be honed to its best form before publications. I am excited to announce that my middle grade troll fantasy, Danger Tastes Dreadful, will be published by Clean Reads. The date has yet to be determined. Clean Reads is a small press with a few hundred authors who write books with an innocent vibe which fits perfectly for my writing. No swearing or raunchy stuff. They started out with clean romance, but have moved into a wider variety of young adult and middle grade as the appeal of the concept has proved itself. I am excited that it will be published in print as well as ebook. I think middle grade readers often want a physical book, and it makes it a lot easier to sign copies to go in my local indie bookstores. I am especially eager to be able to see it in Mac's Backs, a wonderful indie bookstore in Cleveland Heights, OH which has been so gracious about hosting our writer group for the past three years. They are very supportive of local authors. The story of how I got this contract is interesting. I have gone through a number of Twitter pitch contests, but also through agent queries. A lot of agent queries. One hundred sixty eight to be exact. Of those, eight requested fulls and three requested partials. Eventually, every one of those either passed or never responded. I got lots of compliments on the writing and the characters and the story, but ultimately it either didn't grab them or, more often, was too young and innocent. I more or less moved on. 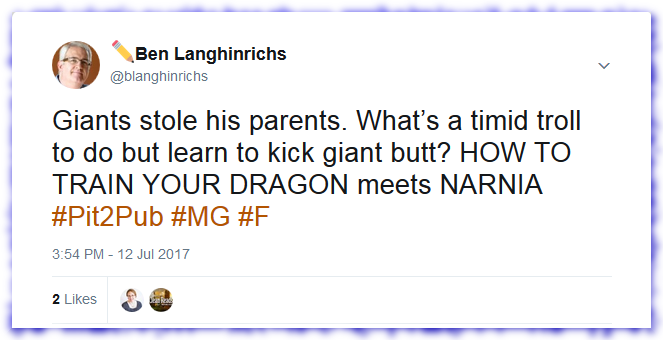 I have two WIPs in particular, and I made sure they were a little older and little edgier, while still being the books I want to write. But I decided that my trolls, Bernie and Tish, would have to wait. Or possibly live in the cave under my bed forever. Then at lunch one day, I was on Twitter and noticed #Pit2Pub trending. (When you follow as many authors and agents as I do, the Twitter pitches always trend.) I've never participated in that, as I was aiming for an agent, but I thought, "What do I have to lose?" It was halfway through the pitching time period, so I figured I'd just pitch once or twice and let the chips fall where they might. So, I went to my document with pitches and pulled out some of my favorites. I wound up posting three. The third got likes from two publishers. (You can see for yourself here.) This is the tweet. I was pleased, but I also knew I had to do my homework. One of the presses was Immortal Works. I didn't find anything terribly wrong, but it just felt too new and too inexperienced for me, plus I wasn't quite sure about the close association with the Mormons. Nothing against Mormons, I just didn't want an overtly religious publisher if I could help it. The other was Clean Reads. It had been around longer and clearly had a more editorial bent, which I wanted. I believe in my writing, but I also believe that it could always be better and I always have more to learn. My only pause was their website, which is being recreated after a hosting problem, but I checked with a couple of their authors who say it was good and will be again. So, I sent Clean Reads my query and full MS, painfully aware of the eight to twelve weeks it said I might have to wait. But twenty four hours later, I got a very enthusiastic message back from Stephanie Griffin, the owner, saying it would be an AMAZING addition to their catalog. That's right, all caps. I've been waiting for the all caps response to this book for well over a year of querying, and I finally had it. So, more research, more talking with authors, and a series of questions for Stephanie to which she had all the right answers. I signed, and less than a week later, I got my NEW AUTHOR packet. Of course, this is just the beginning of the road, but I have to tell you, it is a heck of a lot nicer road than the one which led to the cave under my bed. Walks are wonderfully calming and enjoyable, but they do pose certain risks for a writer. While your feet take one path, your mind is left free to wander on quite different ones. have a ton of writing (and some rewriting) to do. See, risky. But wait until tomorrow's walk!